While she was deployed in Somalia and Iraq as a colonel in the army, Elspeth Cameron Ritchie handled her period with limited privacy, often in isolated or flooded bathrooms for five tours, sometimes as the only woman in her unit. It was “difficult and sticky and kind of embarrassing,” she says. If women in the armed forces don’t want to deal with their periods at all while in the field, the technology is available. Birth-control pills as well as long acting reversible contraceptives (LARCs)—which include intrauterine devices (IUDs) as well as the birth-control implant, which goes in the upper arm—often reduce or eliminate periods. What’s more, LARCs are also the most reliable form of contraception. But recent studies indicate that some active-duty women struggle to receive birth control pills and LARCs. The extent of the issue, however, is unknown. The Department of Defense keeps very little data on birth control and doesn’t often share the information with researchers. Regardless, this problem is only going to spread —all military positions and specialties were opened to women on January 1, 2016. Women currently make up 15 percent of active duty and 19 percent of reserve forces. The ban on women in combat positions was lifted in 2013, but combat needs during the post-9/11 Operation Freedom were so unpredictable, the ban meant very little. Women ended up in combat positions anyway, with more than 800 wounded and more than 130 dead in 12 years of combat in Iraq and Afghanistan. Before then, even if not technically in “combat positions,” women were still sent to dangerous areas. Ritchie earned three combat patches for providing medical care during her deployments. When in Somalia and Iraq in the ’90s, “I wasn’t officially fighting, but I was in the middle of it, carrying a weapon,” she says. Now an advocate of military women’s health, Ritchie, who makes it clear she speaks for herself, not the Veteran’s Association or Department of Defense, is vocal about addressing the logistical and sanitation needs of active service members with periods. TRICARE, the primary health-care provider for armed-service members, technically offers these contraceptive methods. A 2016 reanalysis of previous research published in Military Medicine, however, found enlistees’ access to menstrual suppressors doesn’t always pan out. One 2013 study included in the review was published by Daniel Grossman. An obstetrician/gynecologist at the University of California San Francisco, Grossman was at the time working with Ibis Reproductive Health, an organization that promotes the availability of contraceptives worldwide. In a survey he did of 281 service women, 71 percent said they used contraception for menstrual cycle control. While 58 percent thought contraception was easy or somewhat easy to get during deployment, 33 percent of women said they couldn’t access the birth control method they wanted. Of those who used contraceptives, 24 percent brought enough to last their entire deployment. Forty-one percent of those needing refills found them difficult to obtain. Grossman’s team dug into the reasons why in a smaller set of 22 in-depth interviews published in 2014. The military provides service members with three months worth of medication up-front. The average army deployment is 12 months, so to fill that gap, soldiers are told to use an on-base pharmacy or the TRICARE mail-order service for drug delivery. Grossman’s respondents didn’t always find this advice practical. Remote areas, extensive travel, or trouble transferring civilian prescriptions over to TRICARE sometimes kept them from getting the supplies they needed. Similarly, a study published in 2011 found that 66 percent of soldiers in settings with little privacy and few sanitary disposal options wanted to use birth control pills for menstrual suppression, but only 21 percent were able to use them for their entire deployment. Admittedly, for service members, finding the right time for LARC insertion can be tricky, Grossman says. IUDs can cause cramping and discomfort for some people, which enlistees don’t have time for during rigorous basic training. As soon as that phase is over, people are sent to their stations in the U.S. or abroad, which may or may not have medical personnel trained to implant LARCs. It’s also possible more women in the military aren’t using LARCs because they weren’t educated about the option, Grossman adds. Seventy-eight percent of his respondents never had a conversation with a military medical provider about menstrual suppression before deployment. Other research found 86 percent of the women they spoke to thought education on birth control pills for eliminating periods should be mandatory for women entering the military. Ritchie agrees. Young women new to the military shouldn’t have to ask questions and figure out period logistics for themselves, she says. Grossman still isn’t confident his own questionnaires are an accurate assessment of birth-control use, partially because the military doesn’t collect data on the topic, he says. Every few years, the Department of Defense conducts its “Health Related Behaviors Survey” of active duty service members. While participants are asked whether or not they had or caused an unintended pregnancy, data on answers to that question are not included in the public report. Answers to the follow-up question—whether or not birth control was used—are also left out. The DOD includes no other questions on family planning or menstrual suppression in its survey. After the 2008 DOD survey, Grossman successfully filed a FOIA for the unintended pregnancy data that wasn’t available to the public and published his own analysis, finding that the unintended pregnancy rate in active duty forces is 50 percent higher than that of the general U.S. population. He wanted to repeat the process after the 2011 survey, but this time, his FOIA was denied. Instead, he and his coauthor wrote their updated analysis after finding a public use data file with many redacted variables. Grossman was disappointed by how little information on birth control the DOD provided—and so was Representative Jackie Speier, a Democrat from California. In fact, more DOD survey questions about contraception was one of the many requests to improve birth control availability and education for military women included in a bill Speier recently sponsored. As a member of the House Arms Committee, Speier was drawn to the issue when she and her team read Grossman’s paper on the 2008 DOD survey data. Her bill failed to pass. Instead, two recommendations for the DOD on birth control were included in the most recent House Armed Services Committee report. The first request is that each military medical facility keeps a sufficient stock of all FDA-approved contraceptives. The second is to ensure that service members receive enough of their prescription birth control prior to deployment. Exactly how and when these goals are achieved is for the DOD to plan and execute. Although unintended pregnancies were the first concern, says a representative for Speier, helping women deal with menstruation is a great side benefit. Not every woman in the military thinks periods need prioritizing. Raquel Patrick, a chief warrant officer who served for five tours, says planning for her period wasn’t an issue. Before leaving, she would buy bulk supplies of feminine products and baby wipes. From what she could tell, she says, the women she was with who used birth control had no problem getting what they needed, either. Patrick was surprised to hear that some women never spoke to healthcare providers about their contraceptive options before deployment. For her, that conversation always happened. Patrick thinks dealing with accidents or planning to be away from a suitable bathroom for a while isn’t anything abnormal. “That’s just like any job. Do you really bring it up, or do you just take care of it?” she says. As women fill military positions previously inaccessible to them, Patrick thinks it’s only natural those women will receive attention. 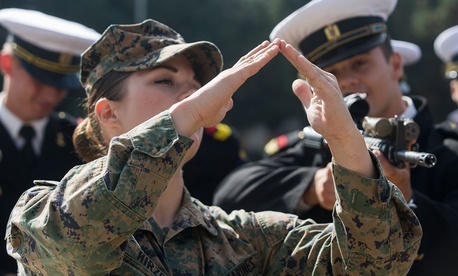 For example, she mentioned that the recent addition of female infantry to the Marines means the Marine leadership will need to brush up on women’s health. If soldiers find themselves unprepared to deal with their periods while deployed, however, that is a sign to Patrick that their commander missed vital information. A military leader’s job is to make sure the health needs of his or her soldiers are being met, she explains—that’s part of being in charge of someone’s life. Patrick says she can see how menstrual care in the military could fall by the wayside in the current political climate, especially if the armed forces have to gear up for more conflict. The Defense Health Agency Office of Health Affairs underscored the belief that a soldier’s health is a top priority. “The Department of Defense is fully committed to supporting the health, well-being, and medical readiness of all service members regardless of gender,” they wrote in an email. “The sea of military women in front of me are quite an impressive lot,” Ritchie says. And they now have more opportunities in the armed services than ever. An infrastructure for managing periods could make the service that much easier.